Common symptoms of upper respiratory infections (URIs), such as sore throat, cough, and inflammation, are often caused by bacteria, sometimes as a complication of viral infection. Extracts of Echinacea purpurea (Asteraceae) have been advocated traditionally for use by individuals suffering from these symptoms. 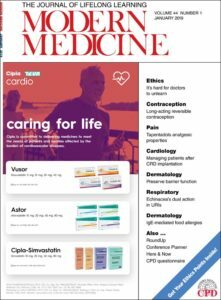 Patients with cardiac rhythm management devices such as pacemakers and defibrillators are cared for jointly by GPs and cardiologists. GPs can manage issues such as wound care, bleeding and pain and provide guidance regarding work, travel and household appliance use. Early complications are best referred back to the interventional cardiologist; they include wound-related issues (active bleeding, infection, large haematoma), unusual postprocedural pain (pericardial or pleuritic pain) and noncardiac muscle twitching. Pain is a disorder that everyone experiences and is often difficult to treat. Current drug treatment options for management of pain include opioids, nonsteroidal anti-inflammatory drugs, and paracetamol. Tapentadol is a novel, next generation, centrally acting analgesic with dual mechanism of action that offers analgesic efficacy that is similar to that provided by a pure MOR agonist, but with an improved side-effect profile. Procedures live on even after they’ve been proved ineffective. It can lead to harms and wasted resources. Part of a doctor’s tool kit is learning new things, but also unlearning some things. The second part may be harder than the first. The benefits of maintaining normothermia are well understood and form an important component of the perioperative process. However, with increasing pressure on hospitals to reduce costs and become more profitable, this treatment modality can take a backseat either because items such as forced air warming blankets are not reimbursed by medical funders or it forms part of the global fee for surgical procedures and is disregarded so as to cut costs. 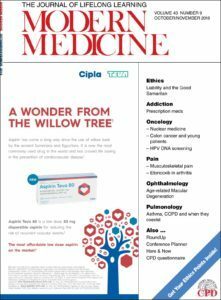 We welcome you to come and read through our latest, Oct/Nov, edition of Modern Medicine. This month we have a jam packed edition for you. Our features this month include; Oncology, Colon Cancer, Pain and many more.